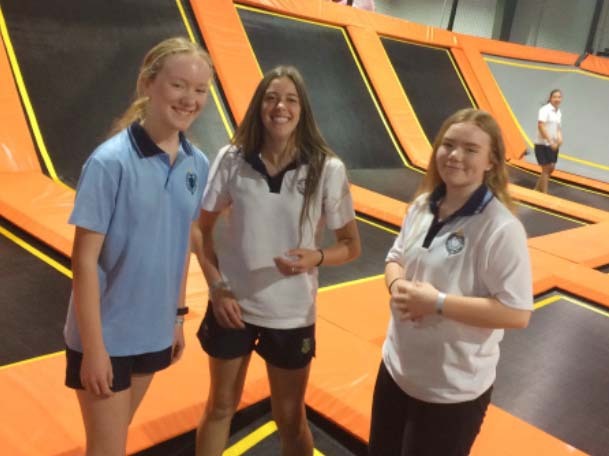 45 teenagers from families with a Current or Ex Serving Member of the ADF from Wodonga Middle Years College Huon & Felltimber Campuses, Wodonga Senior Secondary and Catholic College Wodonga set out to exert some PHYSICAL ACTIVITY for Veterans Health Week. After the Safety briefing, it was all on and the energy levels were high. Young people bounced and climbed, swung and jumped, and barriers broke down of which school each were from. The competitive nature in some arose and Supa Dodge ball and Supa Slam Dunk Basketball became games of defensive and offensive operations. Only the strong would survive! Conversations climbed in volume as the day went on and the young people climbed to new heights, as they challenged themselves physically with climbing the Rock Walls, Tetris stack and the High Ropes Courses. The Competition increased as we went school versus school on the Climbing and Ropes course. Then we had a Brother from Middle Years playoff against his older Bro from Senior. It was all on! Lots of laughs and cheering helped us work up a huge appetite for a delicious healthy lunch. We dived into platters of wraps and subs, loaded with salads, hams and salamis. The chatter increased as new friends were made from other schools, and young people added friends to their real life, face to face friends list. A huge thanks to Department of Veterans Affairs ‘Veterans Health Week’ for providing us with a most wonderful PHYSICAL ACTIVITY and healthy lunch.